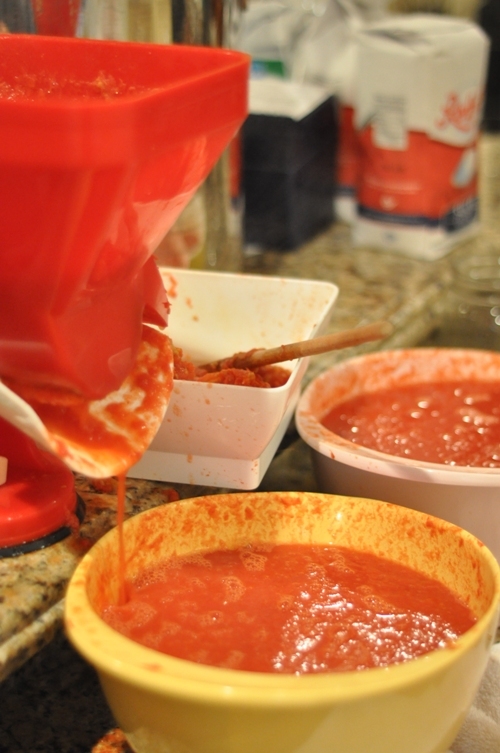 This tomato sauce is a staple in our house and we make it every year. It is the most basic sauce and only requires tomatoes, a couple of large good quality stainless steel pots, heat, and most of all patience. Every year we consume about 70 pints as Matt uses the sauce on/in everything from pizza to lasagna. 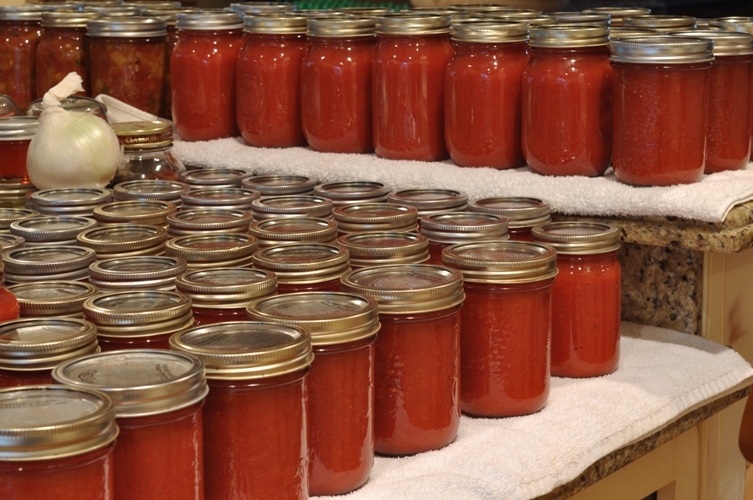 We put it up by the bushel and with two large pots, a tomato mill, and four hours of washing, chopping, and stirring you can create about 25 x 500mL jars. Not bad for a days work!?! Wash tomatoes well. Cut off and discard any bruised or damaged tomatoes. Working in small batches cut and quarter tomatoes. Try to cut tomatoes in equal sized pieces so they will cook and soften at a similar rate. Place cut pieces in a large good quality stainless steel saucepan and cook on medium-high heat. Using a potato masher crush the first layer of tomatoes to release their juices. Meanwhile, continue to cut small amounts of tomatoes. Add to the pot and crush. 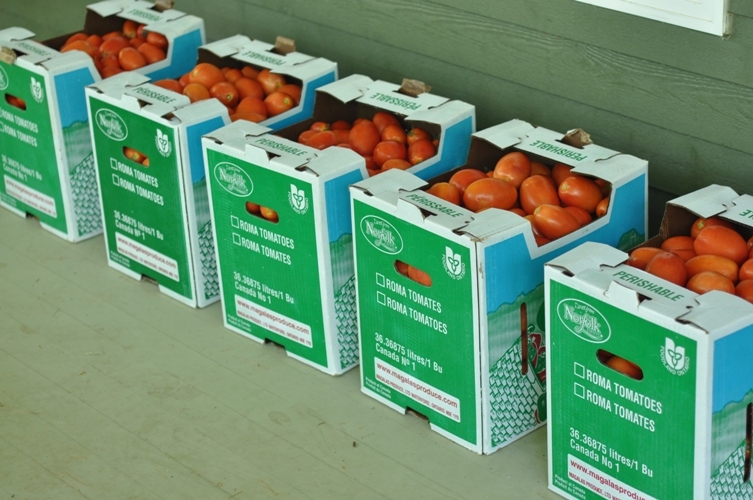 Note: enzymes which break down pectin are activated in cut tomatoes prior to being exposed to heat. 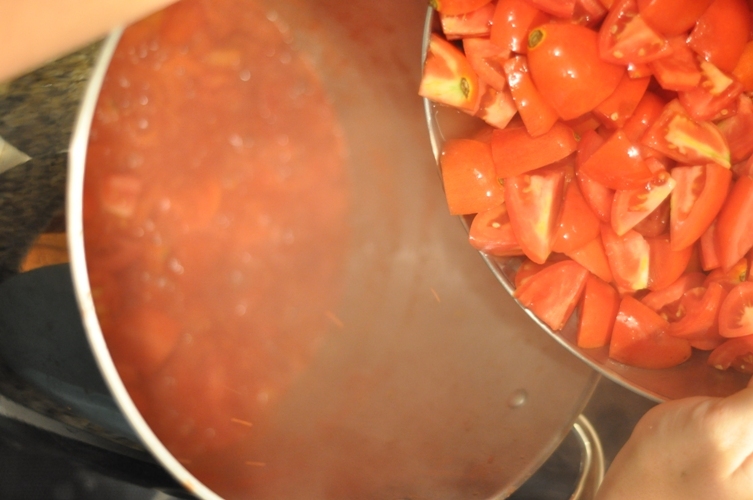 Therefore, it is important to cut only the amount you can add and layer to the cooking tomatoes. When pectin is broken down it can cause liquids and solids to seperate and thus, lead to a more watery sauce. Repeat the process four or five times and cook until the tomatoes are soft and soupy. Remove from heat and allow to cool slightly. Put through a food mill to remove seeds and skin. Collect the juice and pulp in non-reactive bowls. Note: Over the years, we’ve used several different food mills but found this tomato mill makes this job a snap. Place juice and pulp in a second large stainless steel saucepan and bring to a boil over high heat. While the sauce is cooking down repeat steps 1 to 6. You can continue adding the juice and pulp to the already reducing sauce until you have enough to process one batch. Cook sauce until desired consistency is achieved. Remove from heat and ladle hot tomato sauce into hot sterilized jars leaving 1/2″ headspace. Add 1 tbsp lemon juice for 500mL jars and 2 tbsp for 1L jars. Note:we add the lemon juice once jars are half full. We started doing it this way because the cool lemon juice was cracking our hot jars. Remove air bubbles, wipe rims with a damp paper towel, place lids and screw bands on adjusting so that they are just finger-tip tight. In a hot water bath process 500mL jars for 35 minutes and 1L jars for 40 minutes. The process is easy and once you’ve done it a couple of times you can work out a rhythm. 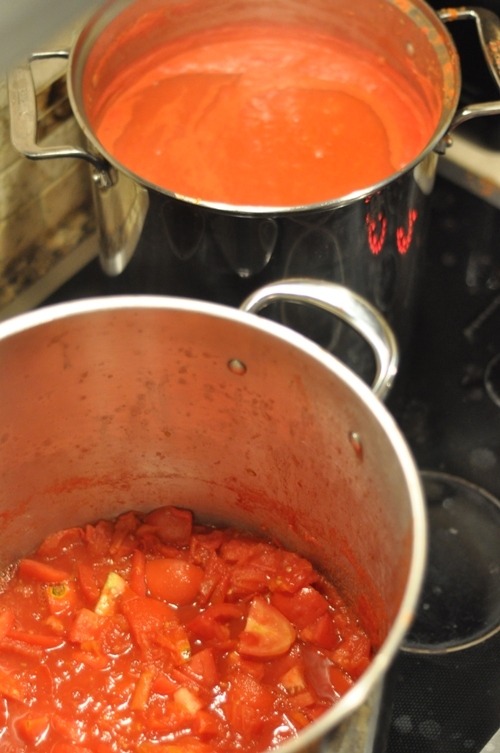 We keep both of the large stainless steel pots going until our 20 litre pot is full of the reducing sauce. 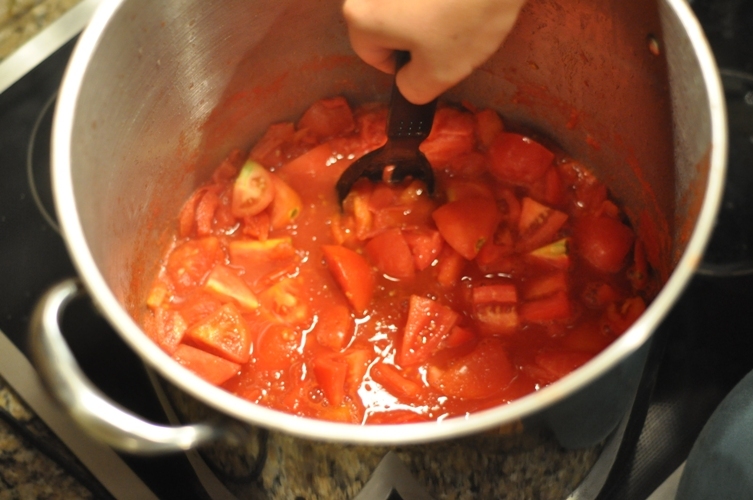 Then we stop cooking and crushing the quartered tomatoes and concentrate on stirring the sauce. It is a time-consuming process but it isn’t difficult. Put your canner on to heat and your jars in the oven to sterilize when you think your sauce is thick enough and then continue to stir. You really can’t go wrong as long as you stir to prevent this precious sauce from sticking to the bottom of the pot. In the past, we’ve made a variety of differently seasoned sauces but now only make this simple and basic sauce. We don’t add any salt or dried herbs as this can be done when you crack open a jar. Add seasoning, salt, meat, and vegetables to this sauce to create something different every time! The two of you are totally unbelievable!!! Love your writing and photos…you’re amazing! Here I was just wondering what to do with my tomatoes! I do have a question: step 10 says water bath, and step 11 says take off lid. Do you process your water bath with a lid? Yes, when you add your jars to the boiling hot water bath you will cover the pot with a lid and maintain a rolling boil for the allotted time called for in the recipe. Here is some more information on water bath canning as well as pressure canning from the Nation Food Center of Home Preservation. After the processing time is up turn off the heat and we always recommend leaving the jars for 5 minutes before removing. This will allow them to cool down more gradually and help to prevent siphoning. The tomato jam recipe is also awesome and a must around our house. If you have any other questions please feel free to comment or email us. I have to admit I’m a little jealous of all the wonderful canned tomatoes that you have! Everything looks great! This year my canning journey has been modest. I made Vanilla Chai Pear Butter, and some basic applesauce. I’m really into the fruit butters this year. This will be my first year canning. I am so excited to find your site. May I ask the brand of food mill you use?